I’m going to revisit one of my favorite cookie recipes today. 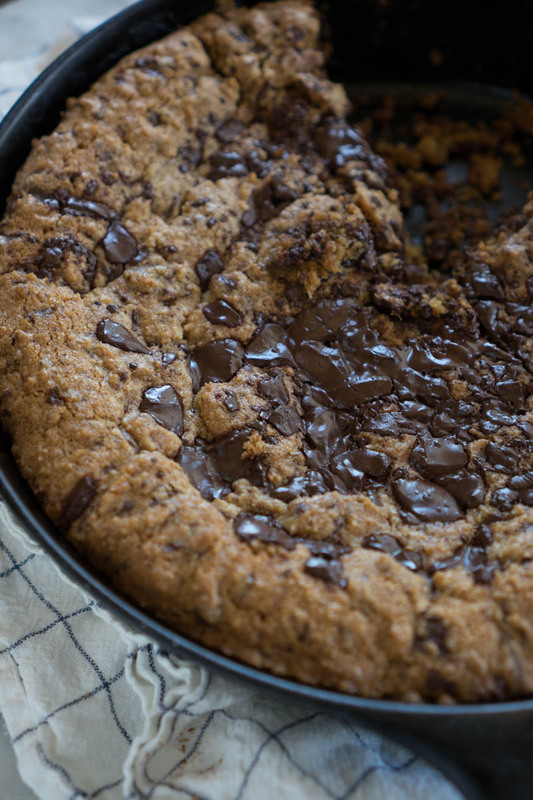 Made using 100% whole wheat flour and hand-chopped chocolate chips, this is a skillet-baked twist on Kim Boyce’s celebrated chocolate chip cookies. It’s also a fantastic recipe to make with kids. We had a house guest this weekend, and this was the recipe he wanted to make. Instead of shaping individual cookies, you spread cookie dough across an oven-proof pan or skillet, and bake it. You can cut the finished cookies into wedges or squares, or whatever shape you like. You can also bake individual versions in tiny skillets or these tiny cast-iron Staubs. Served warm with a little dollop of vanilla ice cream – you get the idea. They’re fun, fast, and couldn’t be simpler. You can see how it all comes together, and meet my favorite kitchen helper, in the video below 😉 Enjoy!